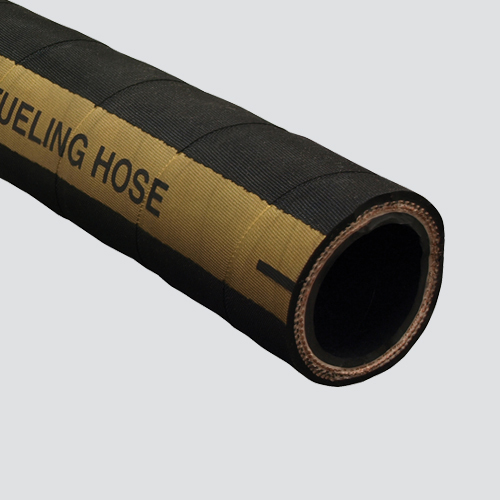 Aircraft refueling hose is a high pressure hose for top deck reel and platform type aircraft refueling equipment. The hose construction and materials provide a path for static electrical charge to ground for safety and minimizes permeation. The premium nitrile tube will not contaminate product going through the hose and the nitrile cover is resistant to abrasion, oil, and weathering. This hose is also suitable for defueling service at low pressures (suction/vacuum rating to 8 in/HG). Meets industry standards API/IP 1529, NFPA 407, and BS EN 1361.